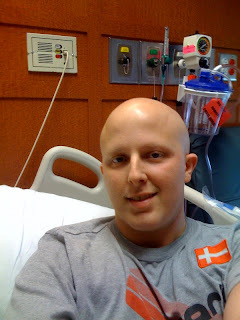 On May 11, 2005, Robbie was diagnosed Burkitt's lymphoma, a rare form of non-Hodgkin’s disease. Soon after, he began rigorous chemotherapy treatment, and he was in remission by August 2005. On July 4, 2006, he noticed another lump on his neck which turned out to be benign. But then in early June 2008, he was told he had Burkitt's again. 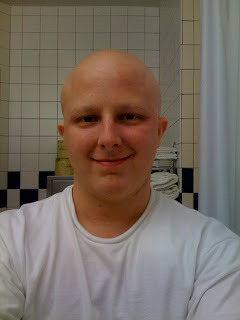 He had 2 cycles of RICE chemo, was in remission, then had an auto stem cell transplant on October 10, 2008. The scans of course showed NO SIGNS OF LYMPHOMA. So I am officially in REMISSION. I expect this to be the FINAL REMISSION and I will never have to deal with this again. My blood counts are near normal. My energy level is actually very good but I am still taking it easy. My taste is back (for the most part), but I still get a little nauseated from time to time. Tomorrow I will probably have what is my last appointment at MD Anderson. I feel pretty sure they are going to give me the OK to be released. It feels great to know I will have my life back. At the same time (even with the hurricane) there are things and people that I've met in Houston that I will really miss. I'm also going to miss the weather because it's been in the 70s here. But I came to kick cancer again and that is what I have done. Mission accomplished. I know I will face challenges in life ahead of me. But I can honestly say I live with very little fear because I've been through so much. I still get people commenting on my "why NOT me?" post from months ago. I heard everyone say that attitude can have so much to do with a cancer diagnosis. Part of the reason I wanted to have this blog is to prove that. In hindsight, I look at how I handled everything and it's no wonder that the outcome is as good as it is. The day I die, I have no idea what my legacy will be on this Earth. But one thing is for sure: it wasn't my time to go. And if it wasn't my time to go, that means I have a bright future ahead of myself. This is only the beginning. I want to say "thank you" again to those who have showed you cared and reached out to me. You have made me feel that I wasn't going at this alone. You should realize that you too are a big reason why I became a two time survivor. If you have followed any other cancer blogs, you see there is a point where there aren't as many posts. And this is a good thing. I haven't been writing a lot because there hasn't been much to say. My blood counts (whites, reds, platelets) all remain low. But not low enough for transfusions or anything like that. It just appears my body is taking it's time in making new blood. I'm still in Houston and will most likely stay here until the counts are normal. Tomorrow, I will update the blog as I get the results from all of scans and see my transplant doctor with an update on what happens next. I'm doing much better than I was. I still get nauseated from time to time and sometimes when I smell food or see food on TV, it makes me nauseous. This is just something that takes time. My energy level is getting better too. I can sit in a chair without having to rest my head! I'm expecting great progress in the coming weeks. I'm not having as many ups and downs and I can feel all that chemo slowly working its way out of my body. Well, it appears the truck has no brakes. It just continues running over me at full speed, leaving me always feeling beat up. Today is 21 days after transplant. I thought I would be feeling good by now, but not yet. I go between feeling terrible and not so good, with the occasional moments of feeling OK. It still hasn't hit me what my body has been through and that I am finished with the treatment. I look pretty sick too. Dark circles under my eyes and finally lost my eyebrows and most of my eyelashes. It's just part of the process. My white counts were actually in the normal range today. 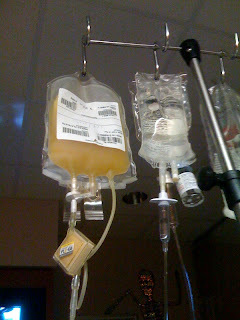 Reds and platelets just kind of laying low and hanging out that way. But I should have a bounce soon. When I went to the doc this morning, my temp was 100.2. 100.5 would have sent me to the ER. They took it 2 times later and it was different both times. And when I take it at home--same thing... my temp seems to go up and down for no reason. But it hasn't stayed at the 100.5 range long enough and hoping it doesn't so I won't have to be readmitted. Each day truly is like a rollercoaster ride. Monday is nothing but tests all day long. I've been having to go to the doctors office every couple of days. I went this morning. Everything was going uphill until yesterday afternoon. I started to feel bad again--kind of like that "run over by a truck feeling." This morning it was hard to wake up. But I haven't been running a fever and show no signs of infection... so the APN (advanced practitioner nurse) overseeing me thinks it's just part of the process. The minute I have a fever, I would be re-admitted back to the hospital. So it's kind of like a bumpy ride--take a step forward, take a step back. My red cells and platelets aren't dropping like they were, but still low. And my whites went way down, but they should come back up again. It's a long process. Today is 19 days after transplant, so it's still the beginning. Just about 1 hour ago, I had my chest line removed. It was very simple... the nurse told me to take a deep breath and with a simple tug, it was out. If you have ever been a cancer patient, you know the feeling that comes with having the line removed. It's really the first sign that you are becoming "normal" again--or a non-patient. I've had to cover the line with Press and Seal, not get it wet, have it hanging out---in addition to flushing it every day and changing the dressing once a week. No more! The line is out and I am free. My blood counts remain very low, but not enough for a transfusion. My major complaint now is that I have a terrible taste in my mouth that never goes away. It's not just a bad taste, I mean, it's terrible. Kind of like always having the feeling you've taken a sip of Windex. It should go away in a few weeks. So I will probably be monitored in Houston closely for the next few weeks and then head to Florida for awhile. I still have very low energy and have to stay away from people for awhile until my counts normalize and my new immune system has a chance to build itself up. But all things considered, I am doing great and starting to realize I really did beat Burkitt's twice. Well, I made it. I was discharged earlier this morning. 13 days after the transplant and 20 days in the hospital. That's actually about the soonest anyone is usually released. My white counts are normal. All my blood counts will kind of be in a state of flux as my body tries to normalize itself again. So this means more blood transfusions. And of course, I have to be really careful not to get sick as this is prime time cold and flu season. My immune system is only 13 days old at this point, so if I get sick, it could be a tough fight. A year from now, I will have to get all my childhood shots/immunizations over again as I am not immune anymore. I thought at this point, I would feel very weak and fatigued. But it's not really like that. I feel more of a weird sensation--like I am in a fog or something and everything seems a little different. This beats feeling bad or like you have been run over by a truck, but I hope I feel normal soon. 30 days after the transplant, I'm finished going to the doctors office on a regular basis. That's only 17 days away. That is one of of the most interesting things about being a cancer patient. You are diagnosed, you go through treatment, then when it's all over, you are kind of thrown back into the real world wondering what the heck just happened over the past few months. But one thing is for sure: you don't take ANYTHING for granted in life. Great news: My WBC came in today at 0.8. The doctors expect this will continue to rise and I should be discharged probably in the next 2-3 days. Don't get me wrong, I'm very excited to hear this news. But everything I have been through the past few weeks are still a bit hard to process. For the most part, I feel OK (no mouth sores or anything), but most of the day I do still have that "hit by a truck" feeling where nothing is wrong, just feel rundown. I thought I would be fatigued, or run down, a little, but I guess I had no way to tell just how much this would take out of me. But there are so many reasons to FEEL GOOD. I made it through the transplant. I made it through treatment for recurrent Burkitt's. I'm NOT dead, I'm NOT dying, and I don't plan on backing my bags for heaven anytime soon. I'm also looking at the calendar... seeing it's Oct. 20 and wondering to myself--what happened the past 17 days. Where did this month go? I always thought with such a long hospital stay, I would be itching to get out of here. But honestly, the nurses have taken great care of me and it almost feels like I'm being rushed out in a few days. ha ha It's just, you think of people leaving the hospital fully recovered, but I still have a lot of recovery to do. The thought just hit me... I have not been off the 11th Floor of this hospital, or seen trees, or people, or anything. Wow, I really have been reborn again and will never be the same person as before this experience. 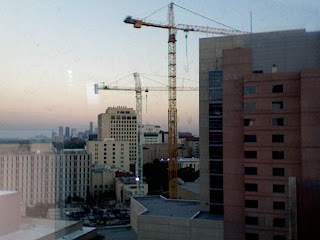 My view of the construction cranes has been OK, but I am looking forward to jumping back in the "real world" as a new man. Today, I didn't do too much but sleep. up to 0.3 (over 4.0 is "normal") Still a ways to go.. The left side. 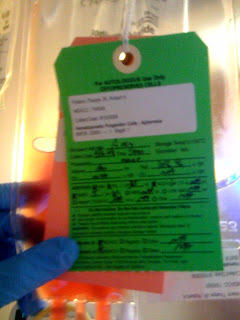 That's what platelets in a bag look like..
cells (even after all this) it would kill them. hospital for only 2 weeks--it feels like a few months. I thought the worst was behind me. on a highway and car tires were rolling over me going 60 mph. me tell you I can't wait to get it back. The mouth sores I had were very bad and painful. So yesterday, my nurse suggested that I take a morphine-like drug through my IV. The pain subsided a little--but I vomited several times and felt horrible. Then, I spiked a little fever, which meant I had to be put on new IV antibiotics, and be sent for a chest X-ray, and more detailed blood tests. I really felt horrible during this time. During the night, the pain was so bad, I couldn't sleep. It became difficult to talk. They gave me more of the morphine drug--but honestly it didn't really seem to help any. You know you are facing a lot of pain when morphine doesn't help. That being said, I had felt worse 3 years ago when I got mouth sores then and my fever shot up. This morning's blood tests revealed my platelets and red cells had also taken a nose dive. No wonder I felt to terrible. I got out of the bed to use the restroom, and my heart started racing. The nurse ran my vitals again and suggested that I stay seated at all times, because if I stood up, my heart was going to start racing again. My mouth sores, this morning, were hurting worse than ever so I was given more pain medicine. When the doctor made the rounds, he said my mouth sores were some of the worst he'd seen. Keep in mind, during the whole time, yes, I am in pain, but it seems like everyone else was more worried about it that I was. 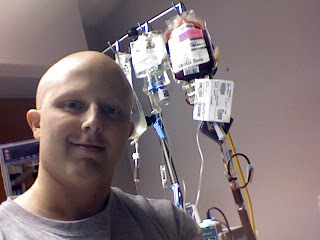 So around 11a, I got my platelet infusion. And as I type now, I am getting my blood transfusion. A blood transfusion may seem like a scary thing, but when you are short of blood, it's about the best thing that can happen. I can now stand up and my heart doesn't start racing. Amazingly enough, the mouth sores are feeling better. I won't have another blood test until tomorrow morning--but it looks like my body may be starting to produce some white blood cells. It could happen anytime over the next couple of days, and when I have more white cells, that means the transplant is working. This whole process is so crazy--and such a rollercoaster ride. Yes, you feel bad, but the crazy part about it is just wondering what's going to happen next and how you are going to feel in a few hours. But I really do think the worst is behind me. And as each day passes, it's going to get easier and easier. cotinue to bottom out, but not enough for a transfusion. have to have some before the day is over. to patients in my condition. I'm still hanging in there. It's amazing how slow the days go by. do when you are waiting for you stem cells to start making blood cells. two in the coming days. it can mask possible infection. worst part, and by the end of the week, counts will be on the upswing. right place and condition for a human being to consume food. One day at a time. That cliché rings so true giving this situation. like never before once this is all behind me. This is a rites of passage like none other... But I wish it on no one. Ok... Not to be a baby, but can I say I finally don't feel well. drugs that have been pumped into me are taking effect. box of chalk in my mouth. I'm doing great overall. I feel good and have good energy. that, but it's to be expected. there is always the chance of a bottleneck. Transplant day. It took under an hour to have my cells put back in me. In between, I bottom out so the critical period starts in a few days. 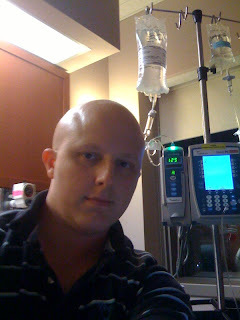 Not to long ago, I finished the last chemo I will ever have to take. It's called melphalan. The chemo protocol I was on was called "beam". but they usually pass after awhile. you look at it... I bag takes about 3 hours to go through my veins. 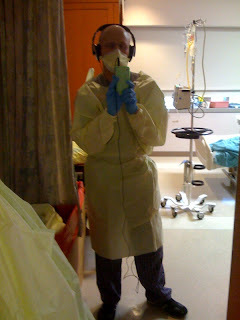 leave the floor and have to wear mask and gloves when I leave the room. Me 5 days from transplant.. Excellent day. 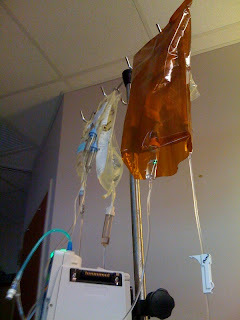 The chemo drug I had today I do not even feel. I walked around the nurses station (which they highly recommend) for about 30 mins today I think that helped big time. 1) To be one of the fastest recovering transplant patients. 2) To keep a positive attitude throughout this entire process. I do have a slight headache, the nurse gave me a pain pill for that. So etoposide/cytarabine starts Sunday morning at 6a sharp. Each drug takes 2 hours for a total of 4 hours. This will be repeated at 6p. So a total of 8 hours of chemo in one day! Four days of these drugs like this: Sunday, Monday, Tuesday, Wednesday. Bring it on. line exchange I had had-- so that's why she kept singing the song. is Melephalan. Then there will be 2 doses of Rituxian. A lot of drugs! But it takes a lot to kill off someone's bone marrow..
Well, I have been officially welcomed into my new home, room #1166. Earlier today, I stopped by the Olive Garden to get some carryout for dinner. I told them this would be my last REAL meal for awhile, so they hooked me up with some special soup and a bag packed with fresh breadsticks. The Tour of Italy never tasted so good. Then around 7p tonight, I got the call that my room was ready. I packed clothes, books (mostly inspirational/positive thinking kind of books), and all my gadgets. Then, I told my temporary apartment goodbye and went on my way. The shuttle bus has it's last run at 730p and I was able to make it in time. It's a large bus, the size of a Greyhound, but nice. Over the past few weeks, I'd made friends with Lisa, the morning driver. Lisa loves to talk and it isn't her job to just drive the bus. She has to know how you are doing, what's going on with you. She doesn't work for the hospital--just a charter bus company, but makes things better for the patients. (The passengers are usually a mix of patients and medical students). Lisa also told me she knew of another guy from Atlanta that had been at Emory and was now being treated at MD Anderson and regularly rides the shuttle. I didn't know the evening bus driver that well. We'd never talked. As I went to board, he saw all my bags and I told him I would be in for probably 2-3 weeks, maybe a month. "You having a transplant?" he asked. He knew all about it. The bus drivers see transplant patients all the time, so it's no big deal to them. I was the only passenger on the bus and sat in the front seat (just imagine being the only passenger in a Greyhound)! But we chatted the entire ride to the hospital. And once I made it to MD Anderson, I had kind of forgot that I was on my way to be admitted for the most major medical treatment I will ever receive. The driver talked about how he sees so many patients that do so well and that MD Anderson is the place! Turns out he also used to live in Atlanta. He told me the story of a 21 year old guy that recently had a transplant, and afterwards, you would have never known anything had happened to him. I told him, yeah, it's gonna be tough, but that's gonna be me the next time you see me! Over the past few years, 7-11 has always been a kind of "lucky" number for me. No joke. 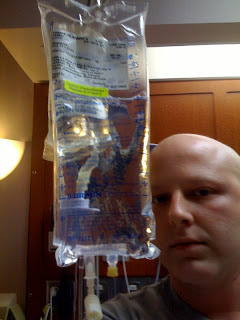 Tomorrow they change out my chest line and we get the party started with the first high dose chemo drug. I will be admitted this evening. Tomorrow, they will change my chest line to a smaller one and start the high dose of chemo. Different drug cocktails will go on until Thursday, October 9. Friday, Oct. 10 is my transplant date and I will receive my stem cells back. (Kind of anti-climatic, in a way). The most difficult part will be the following week, as my blood counts bottom out and I will have no white cells and get a new immune system. All in all, I will probably be in the hospital for about 3 weeks. I'm ready. I've known I would have to go through with this for months. But as it is about to happen--I have one last chance just to feel good and know I probably won't feel as good as I do now for quite sometime. It's an odd feeling. There are people who don't make it through this procedure, but I know I'll do just fine. I look at this transplant as a kind of rebirth--a chance to start over again at life and a chance to truly be happy and never take anything for granted. You hear that phrase a lot, to the point it becomes cliche, but for me, it's a very real concept. I'm excited about what this new phase in life has to offer. The good thing about all of this: it's the final showdown in my 2nd battle with cancer. And it's fight I will win. Please keep me in your thoughts and prayers. I can't wait to celebrate once this is all behind me and I have my energy back. LOOK OUT world! My liver blood test showed some signs of improvement, but my transplant doctor wants to wait a little more time until Friday. Keep in mind, it's normal for your liver to be under a little more stress than usual as it tries to rid my body of the chemicals that have been pumped in me the past few months. But I'm about to get an extremely high dose of chemo (non stop for 6 days). So my doc is just giving my liver a break before hitting it really hard. Back in Houston now. I was supposed to be admitted either Friday or Monday. One of my blood tests for my liver came back a little suspect--so they are going to retest me on Tuesday and decide whether to admit me then or hold off more. The chemo can be tough on your liver--but sometimes certain drugs they give you can cause the numbers to be off as well. I'm just hoping the liver issue is a side effect of the Neuprogen shots I had to give myself to boost my white count before the collection. Remember when I first started and my fingers were numb after they hit a nerve putting in my PIC line? That numbness lasted over 3 weeks. I learned the first time I beat Burkitt's and this time as well--when little problems present themselves, it's best to not worry about them too much. It doesn't really help. Just say a little a prayer, "it's going to be alright" and that's the best way to deal with it. collection! They only need 5 million and I gave them 8 million. 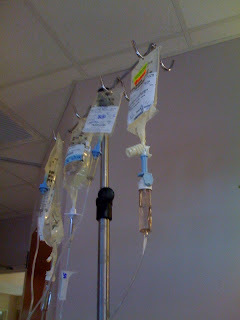 dose chemo in a few weeks. the grocery stores (and some food places) are open it's not as bad. And being 60 degrees at night (makes it 75 inside) certainly helps. So I'm done with day 1 of the blood collection process ("apheresis"). your white cells ( which contain the stem cells in them). Hospital social workers are making calls to try and find me a hotel. power. You know how fustrating it is to lose power for a few hours.